Football is a sport with a lot of history, so picking the greatest teams that ever played together is not easy. There is a lot of bias that comes into play whenever football is mentioned and there will be readers who question why certain teams did not make the list. There has been much speculation about the current Spanish team and having won the world cup and defended a European Championship, there is a good argument for them taking the top spot. It is unfortunate for the Spanish, but many believe the 1970 Brazilian side were the best team ever assembled and they may be right. Brazil beat Italy in 1970 by four goals to one and they were practically unstoppable on their way to their third world title. 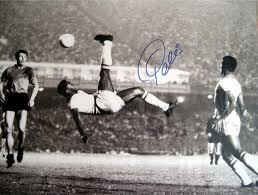 Carlos Alberto captained an illustrious team that included Pele, Clodoaldo, Tostao and Jairzinho and they were undefeated all the way to the final. The world cup was held in Mexico and Brazil was undefeated during the qualifying stages. England has beaten Germany in the previous world cup and that had been a tough affair and a very physical competition. The Mexican world cup was completely different with teams eager to show flair and attacking football. The intense heat meant that physical competition was never going to win games; skill was the currency of champions in South America and Brazil were the richest players in the tournament. Few games since have come close to displaying the sort of skill level that the Brazilian team oozed throughout the tournament and in the final game. This was a golden era for the AC Milan team, who were no strangers to success, but their greatest feat was successfully defending the European Cup. They won the title in 1989 and 1990 along with the Super Cup in 1990 and they won the Serie A title in ’92, ’93 and ’94 as well as retaining the European Cup again in 1994. Some of the greatest players ever to play for AC Milan were in the side with names like Ruud Gullit and Marco van Basten who have both become legends of the game. There have been many great teams since the AC Milan spell at the top, but money and player wages that have contributed to the success of those teams. When AC Milan defended the titles, they were not poorly paid, but there was no money in the game then as it is now. Real Madrid won the European Cup five years in a row when they took every title from 1956-60. No other team has managed to come close to the dominance of the team. Ajax and Bayern Munich have both won the title in three consecutive years and Liverpool have won it two years running, but none have threatened Real Madrid’s feat. During this period, they had three different managers with Spaniard Jose Villalonga winning the first two before Argentinean Luis Carniglia took the following two titles. In 1960, another Spanish manager took the reins and Miguel Munoz extended the record that stands to this day. No other team has won the top competition in club football more times than Real Madrid, who have a total of nine titles. Milan are the next closest team with seven titles and English Premier League teams Liverpool are third as five time winners. Real Madrid’s main rivals Barcelona, have just four European titles. That is why the Real Madrid side of all those years ago has to be better than the current Real Madrid players who beat the Catalan team that everyone believed was invincible in the last season of La Liga. There are probably Manchester United fans wondering why their teams have not had mentions. There are also thousands of Arsenal fans, who believe the ‘Invincibles’ that played a whole season unbeaten need to be mentioned, but the truth is that there are always reasons to follow your own team. In bookmakers in the UK and around the world there people who are looking at Manchester City betting. Everyone is trying to find a good price for bets on City to retain the title. How many titles will they need to win to have their team in the top teams of all time? This entry was posted in Soccer and tagged 1970 World Cup final, AC Milan, Arsenal, Barcelona, best football teams ever, bicycle kick, Brazil, Brazilian National Soccer Team, Carlos Alberto, Catalan, Clodoaldo, England National Football Team, English Premier League, European Championship, European cup, football, football history, Germany National Football Team, Italy National Football Association, Jairzinho, Jose Villalonga, La Liga, Liverpool F.C, Luis Carniglia, manchester united, Marco van Basten, Mexico National Football Team, Miguel Munoz, milan 1989, milan team, Pele, Real Madrid, Ruud Gullit, Soccer, Spain National Football Team, spanish team, sports, sports and leisure, Sports Archives, Tostao, world cup winners. Bookmark the permalink.